Composer Ryan Shore is joined by Julie Andrews and friends. 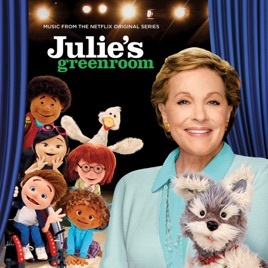 We love Julie’s Greenroom but are disappointed that all of the songs by the guests were not included. Some of our favorites are missing. We love this show, but as a sing-a-long family, we were very disappointed that not all of the songs from the show were on the soundtrack. Some of the guest's songs were covered well, but the album as a whole is not complete without the larger variety of performers that the show promoted. Probably shouldn't have bothered to make the album if not everyone would agree to be on it. Fantastic Show, Fantastic Soundtrack! Where are the other songs? I love the show! As a theater person it makes my heart so happy! I also really love the attention that was paid to all of the music. The only reason I am giving the soundtrack 4 stars is because it does not include all of the wonderful songs from the show. When can we have the rest?